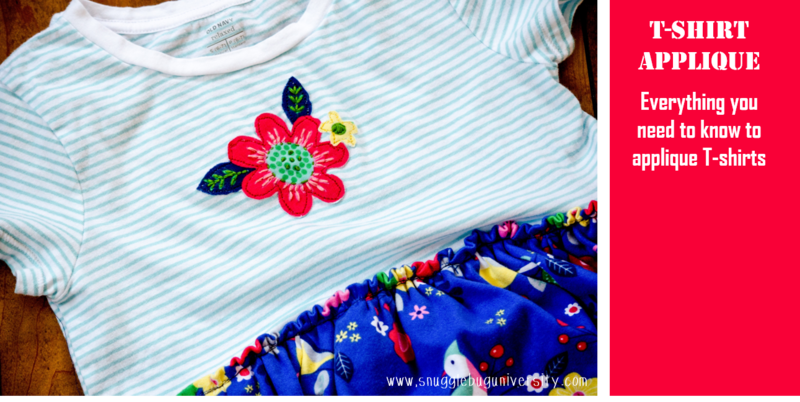 I've always really loved applique in children's wear. I seriously drool over the Mini Bodon catalogs... Just SOOOOO CUTE! 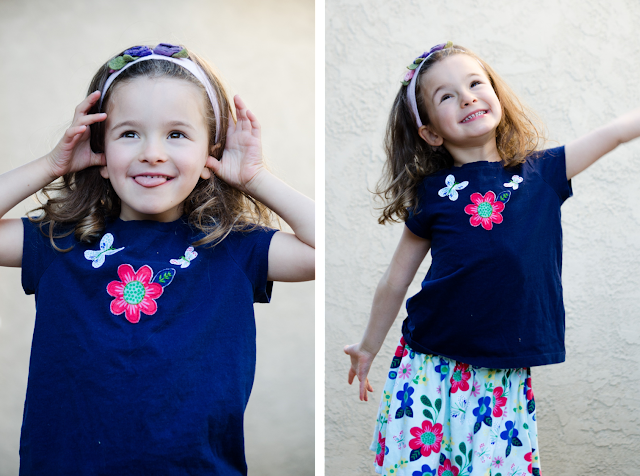 I made Lu the t-shirt dress above before she started school a few weeks ago, and I got to say I LOVE it! I added a little hand embroidery to the applique on the t-shirt top, and that was pretty much the sprinkles to an already fun applique. and I even appliqued a heart shirt for myself for my Halloween costume, which you can now see below! 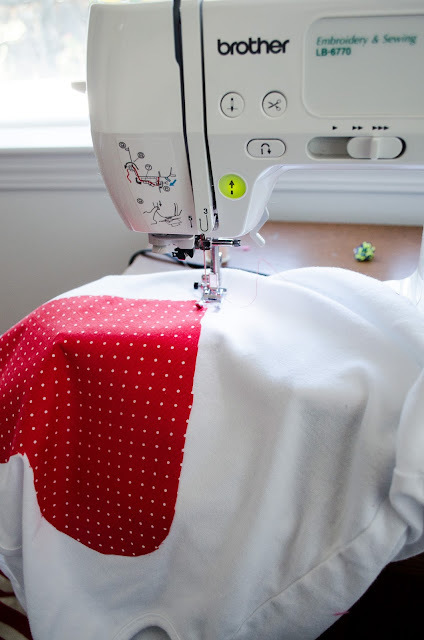 I'm going to show you today how I made my appliqued shirt for my "White Rabbit" costume. You can find the rest of the tutorials for the rest of the family costumes on the Make it and Love it blog. This post is going to cover the general basics of appliquéing on T-shirts though--just as I did for my white rabbit costume and the kids clothes I just showed you! Here's what I've learned about appliqueing on t-shirts. 1. Knits are awesome. 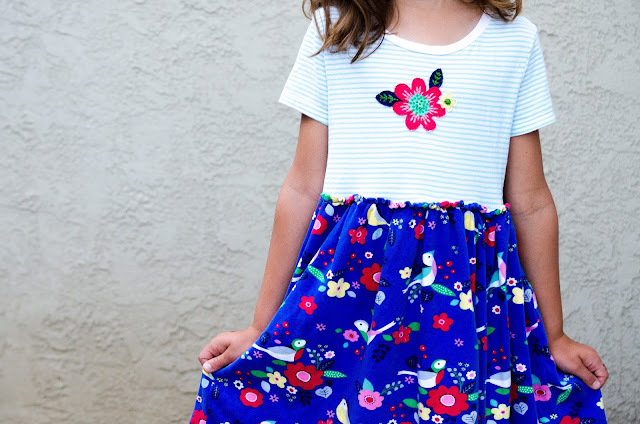 It's absolutely dreamy to cut out an image from a knit fabric (as I did in both examples above) and use that for your applique. Knits don't really fray, which means that it's totally ok to just sew around the edge of the design. You can use a woven fabric too. The edges will fray a bit until your seam, but the fraying will stop there. I made this t-shirt with a heart appliqued on for my Halloween costume for this year. I can't wait to show you them all in a couple of weeks! 2. My grandmother always taught me to use a zig zag or satin stitch to secure the design. I played around with zigzag stitch, but I really don't like how these stitches aren't very forgiving around curves. They show every imperfection! I love this stitch! It's so much more forgiving than the zig-zag! (but the zig-zag will work too). 3. Otherwise applique is pretty simple. You cut out a design out of fabric and the same shape out of fusible interfacing. 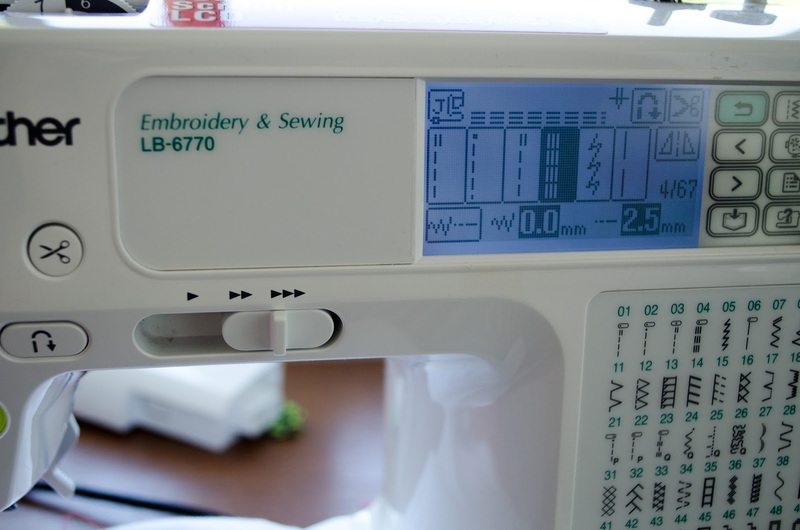 When choosing the interfacing you should always use interfacing that is of a slightly lighter weight than your fabric. I just used Wonder Under because it is what I had on hand. It seemed to work fine for the knit and woven fabrics that I used. You iron the interfacing to the fabric piece, and then remove the interfacing. 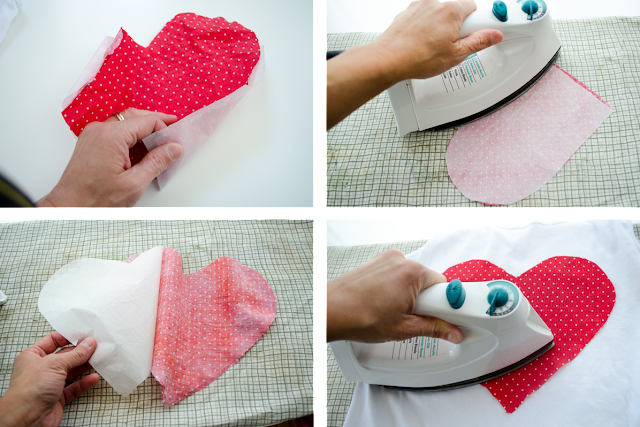 Then iron the design to your t-shirt. 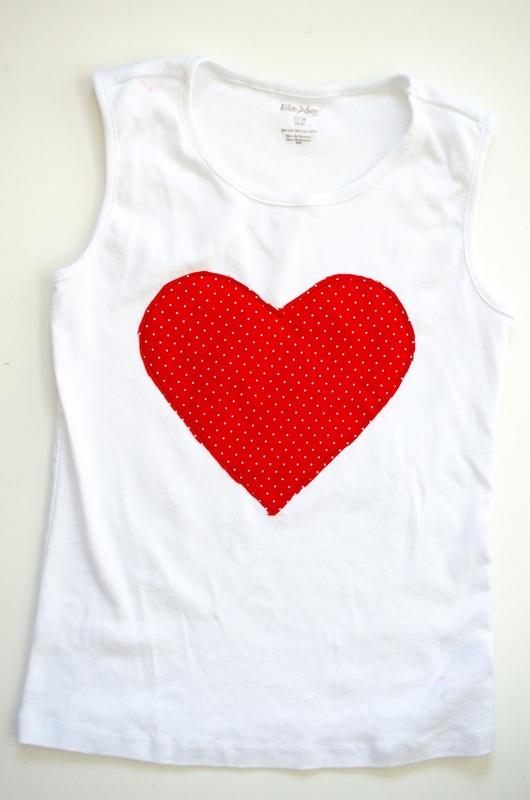 Then you just sew around the edges of the heart to help secure it to the t-shirt, using a stretch stitch. For the knit appliques above I added a little bit of embroidery floss to embellish the designs a little bit further. I hope you liked this little peak into my latest projects! It really IS as simple as you make it look!! 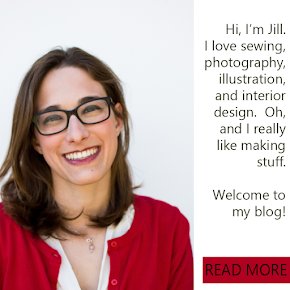 Thank you for your insights & the 'tip' on the triple stretch stitch! That must have been fun learning machine embroidery that way.